I'm trying to find my way around ORK's API better by simulating events from the tutorials via script. Does anyone know how I could call up dialogues like ORK events do? 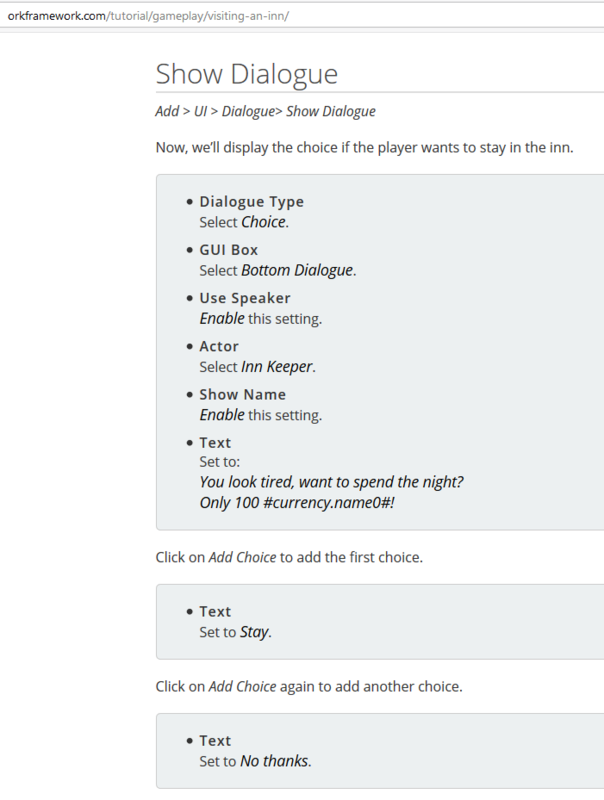 For example, how would I simulate this "Show Dialogue" step from the Visting an Inn tutorial? While it's possible to do it, why would you want to do that? Anyway, it's probably best to take a look at an existing example in ORK's code, e.g. the QuestionChoice class. Just displaying a dialogue is only a few lines of code, but reacting to ok/cancel or choice selection requires you to write a class that implements the IChoice interface to handle dialogue control.